27 Brain-Friendly Kagan Instructional Strategies to Make Learning Come Alive. 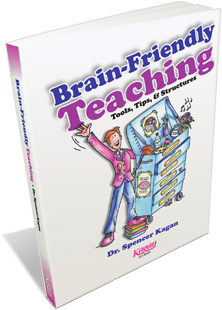 The Most Extensively Referenced Book on Brain-Friendly Teaching—over 1,000 References! To promote performance, celebrate or praise before performance. To cement memory, celebrate or praise after performance. Allow yourself to be silly with your students from time to time. Practice progressive muscle relaxation with your class and use the technique before big tests or other times of high stress.